6. Hit next and follow the prompts to completion. c. Password: Should already be filled in, if not have student enter password for Newberry College email account. NOTE: On apple the user will need to supply their password on the outgoing server setting otherwise they cannot CC themselves on emails sent from the device. 13. After all information is put in; Hit Save and follow the prompts to completion. The tutorials below provide a slideshow on navigating Mobile Wolf Den. To view the entire slideshow, continue clicking 'next'. Click 'prev' to return to a previous slide. 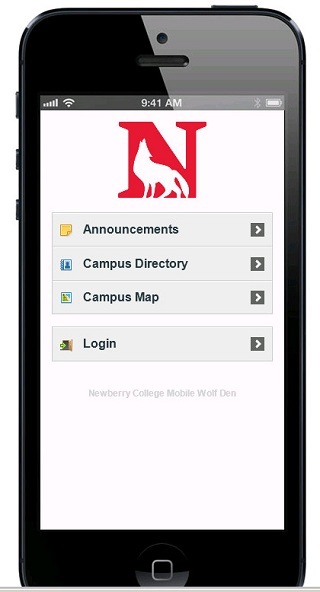 Clicking on the Newberry College Wolf logo will always bring you back to the main page. The logo appears on each page in Mobile Wolf Den. The log in credentials for mobile Wolf Den are identical to those in standard Wolf den. Use the same user name and password for both. 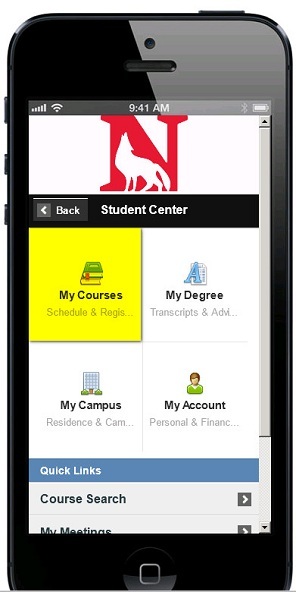 The Student Center has four Quick Touch items and direct links to an additional five commonly used items. The MY Courses Quick Touch provides access to your current course information and includes Add/Drop functions, course schedule information and the ability to perform course searches.